As part of the price for the cooperation of the Green Party in the Scottish parliament, the Scottish Government has agreed to give local authorities the power to introduce a levy on workplace car parks. “Plans to give powers to councils to introduce a workplace parking levy, as already allowed in England, will come forward via an agreed Green Party amendment to the Transport (Scotland) Bill. ” This is intended to reduce the numbers of people who travel to work by car. It’s been tested in Nottingham, where it’s been claimed to reduce congestion and raise revenue. The key objections to rationing by price are threefold. First, the demand for any activity depends on the resources that people have, and the people whose behaviour are most likely to be affected are those on the lowest incomes. Almost by definition, people on lower income have to be more sensitive to marginal cost than people on higher incomes can be – and the introduction of a flat-rate levy takes far more from the incomes of lower paid workers than it does for higher paid workers. It’s important to consider for any policy what the distributive implications are. Second, it’s essential to understand what the effect on behaviour might be, and changing the price of an activity is a blunt instrument. Some substitutions may be desirable – such as cycling to work instead – but it can lead to people substituting different, less desirable behaviours instead – for example, parking on residential streets instead, driving more and longer while looking for parking places, absenteeism or resignation. Third, it may conflict with other policies – recruiting specialist staff such as nurses and teachers, encouraging people to take up work at a distance, getting people to take longer hours by flexible employment practices. I’ve argued before on this blog that there is a wide range of rationing measures, and rationing by price is markedly inferior to some of the alternatives. None of that means that rationing by price is never appropriate – there may be exceptions (reducing the demand for cigarettes by price could be one) – but it does mean that it’s hard to justify, and there are usually better ways to achieve the ends. Before penalising people for turning up to work, try some of the alternatives: encouraging collective transport such as employer-funded buses; provide rail season tickets and bus passes; tilt the balance towards remote working; tie site development planning to transport provision. It’s odd to see the Green Party advocating a set of market-driven measures that would sit more comfortably with the Institute for Economic Affairs than they do with the people-centred economic policies that the Greens claim to support. It’s being reported that Universal Credit is to be delayed again. There are also suggestions that a small number of minor tweaks will be made – allowing legacy benefits to run on for two weeks, changing direct payment rules and altering rules for self-employment. None of that really gets to the heart of the problems. The system is simply not designed for the variety and complexity of conditions it is supposed to deal with. 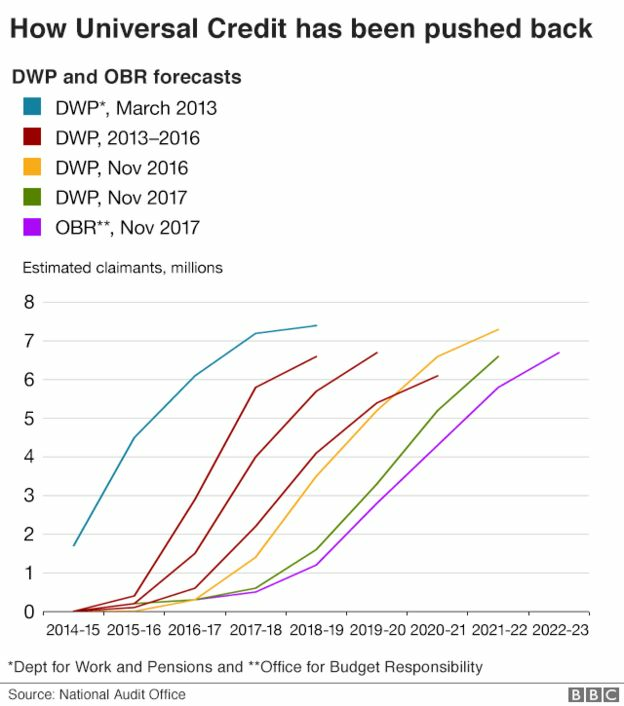 The BBC offers this graph of delays, citing the National Audit Office as source. It’s kind to the record, because it waves aside the failed attempts that led to the system being “reset” in 2013. The original deadline for the completion of the rollout was not 2019, but 2017. The planning has, of course, been going on since 2010, and at no stage has it ever seemed likely that UC could be delivered, as Iain Duncan Smith repeatedly claimed it would be, on time and within budget. I’ve been blogging about the problems with Universal Credit since October 2010, and complaining about the bogus claims made for it since the first glimpse of a business case in 2013. The Treasury failed altogether to follow its own procedures, undertaking massive expenditures before any plan had been submitted. The lack of routine scrutiny has been scandalous; but not as scandalous, I regret, as the way that claimants have been treated in the hope of sparking life into the monster. The Corporate Plan published by the new agency, Social Security Scotland, is brimming with good intentions. Under the agency’s name is the motto: dignity, fairness and respect. The key to this rests in how the agency deals with mistakes, and there will be mistakes: introducing complex systems for people with complex problems to resolve makes that inevitable. There are some good signs: a commitment to resolving issues “resolved quickly and at the point of contact”, listening, and ‘continuous improvement’, using feedback to improve the quality of services. The problem, however, rests in a bitter legacy of conflictual, adversarial approaches to managing agency mistakes. Several elements of the new system create hurdles to overcome: mandatory ‘re-determination’ (the decision should have been checked anyway on first complaint), referral out to the Scottish Public Services Ombudsman (another hurdle), and heavy reliance on the appeals structure. This may all work work against speedy and effective resolution. In the UK, ID cards were abolished post-war after people refused to cooperate with the system, and their reintroduction has been fiercely resisted. It’s seen as the action of a domineering state and “Big Brother”. In India, the Aadhaar card has been used to impose controls on issues including tax evasion and terrorism, and it is being challenged as an invasion of privacy. It’s clear that the problems of being without documentation are a major blight on the lives of many people, most obviously in the USA and more recently in the treatment of Caribbean immigrants in the UK. But processes which include some people can exclude others, and there are concerns from India about people who have been left out. The lesson for public administration ought to be that no system is perfect, and the test of a good system is how it deals with mistakes, omissions and exclusions. This is not so much about a sophisticated technology as about how services relate to ordinary people. My work in Poland is coming to an end. As I write, the University where I’ve been is engaged in a dispute with the Polish government about new legislation which will change the way that universities are organised. The constitution guarantees the autonomy of universities, and so does the disputed bill; but the three references to autonomy in principle are somewhat outweighed by more than 200 substantive references powers being given to the Minister. They range from relatively minor powers (for example, that the Minister can direct a university to appoint someone to teach sports) to rather more important ones. “Law 2.0” is framed in the belief that it is up to government and the parliament to determine how universities are run. The constitution and operation of universities is subject to the government, including how the university should be organised and run, whether the university can undertake research (the classification of universities as vocational is explicitly subject to the administrative power of the minister in article 15) and who they can appoint to be their professors. As I read it – I have to rely on my computer for detailed translations – the Minister determines what is a university and what is not (art 35), and art 40 suggests he can refuse if a university is ‘grossly in violation of the law’. The Minister apparently has the power to order a university to close (art 36), as well as the power to dispose of any remaining assets (art 37). There are clauses governing what subjects can be taught and even what the curriculum should be. the constitutionality of Polish laws can no longer be effectively guaranteed. This situation is particularly worrying for the respect of the rule of law since, as explained in the Commission’s Recommendations, a number of particularly sensitive new legislative acts have been adopted by the Polish Parliament, such as a new Civil Service Act, a law amending the law on the Police and certain other laws, laws on the Public Prosecution Office, a law on the Ombudsman and amending certain other laws, a law on the National Council of Media and an anti-terrorism law. The central problem, as far as I can make it out, is not that the government is determined to undermine the rule of law; it’s that they don’t believe the Constitution really matters that much, that all it offers is a series of principles, that it’s open to the Sejm (parliament) to pass whatever laws they think fit, and that as a government they’re the people in charge. In the case of the universities, they think that universities are public institutions and that public institutions have to be kept under public control. There’s a very fundamental misunderstanding there. A constitution is a ‘basic’ law, not a set of guidelines, and it underpins everything that follows. A billion people in the world defaecate in the open, largely because they have no toilet. Half of them are in India. The graph below comes from an atlas of the Sustainable Development Goals produced by the World Bank. The government of India hoped, five years ago, that it could end open defecation by 2019. It is well behind that target, but claims that 72.3 million toilets have been constructed, out of a target of 110 million. Reports from India number such things in lakh, a unit of 100,000; 72.3 million is 723 lakh. The position was slightly confused last month by the Prime Minister’s claim that the state of Bihar had constructed 8.5 lakh, that is 850,000, toilets in a week – it seems that the toilets have been constructed, but not so quickly. The Economist is sceptical about the figures more generally; some of the toilets that were supposed to be constructed appear not to exist, the claims of one state to have ended the practice have been shown to be false, and besides some people continue to defaecate in the open even though they have a toilet. In Bangladesh, improved sanitation has been linked to education about hygiene, to great effect. Regardless, the government deserves some credit for the priority it has given to issues that are intended to make people’s lives better – including housing, electricity, financial inclusion and sanitation. The DWP has issued a consultation about changes to the claimant count. Once upon a time, we used to have a count of the numbers of people who were unemployed. That count was persistently too high, despite a long series of downward revisions. In the 1980s the government started to use the ‘claimant count’ instead, focusing on benefit receipt and excluding many people who were looking for jobs but who weren’t claiming benefit. The claimant count series goes back to 1971; it correlates with unemployment figures, but it is usually lower. Now, all too predictably, the claimant count has been rising. It’s happened because the rules of JSA, ESA and Universal Credit demand that people are treated as looking for work. The two options in the consultation are both intended to massage the figures so that things don’t look quite so bad. There is another option, of course. The ONS already keeps figures from the Labour Froce Survey, which counts unemployment in the terms of the international definition used by the ILO. The series goes back to 1984, when the government dropped the old count of unemployment. It has also stopped using the claimant count from its Labour Market Statistics, because it’s meaningless as an economic indicator. Indicators are not particularly useful when the conditions they’re kept under change. So why are we using the claimant count at all? The Aadhaar card is an electronic system for managing the identification details of the population of India. The current case against Aadhaar in the Indian Supreme Court is principally concerned with issues of privacy and data management; the main argument in the court is that the card is unconstitutional, and creates the mechansims for a ‘surveillance state’. From the point of view of social administration, it is a greater concern that people have to have a card before they can receive benefits and services. That issue was being flagged more than a year ago, with people being denied access to rice rations because of problems in the system. A recent report in the Washington Post adds many more examples – access to schools, food or pensions. One of the advantages claimed for the Aadhaar card was that it was going to reduce welfare fraud. It has had the opposite effect: people who supply the services may be able to pocket the resources that people have not been able to access. This looks like a classic case, of imagining that the arguments for a particular IT process are universal, and disrearding the conditions where the system has to operate. There’s a further problem, too: that even if the process seems straightforward in its own right, mistakes are very difficult to correct. This system is supposed to deal with the largest population in the world of people who can’t read or write. I have made a donation to Oxfam. While I have some reservations about Oxfam’s stance on a range of issues, I have none about its integrity. I’d like to endorse Richard Murphy’s defence of the organisation, and his follow-up. Oxfam took swift and serious action in relation to its staff in Haiti in 2011. It reported that there were problems at the time; the offenders were fired; and since then it has publicly reported on its actions relating to child protection (most of which concerned its charity shops). Oxfam’s main failing was that its disclosure was not full; I am not sure that it could have been. Oxfam’s 100 strong team, including 15 emergency specialists, was on hand to respond with provision of clean water, shelter and basic sanitation, as well as by helping community canteens provide daily hot meals. By providing paid employment to the people in the camps; to keep the camps clean, build latrines and clear up their destroyed neighborhoods, we put money in the pockets of those who needed it most and helped them improve their living conditions. We reached 300,000 people with aid in the first three months. The level of destruction and logistical challenges were among the worst Oxfam had ever faced. The Oxfam office and a key warehouse full of vital water and sanitation equipment were destroyed when the quake struck. Like thousands of others in Haiti Oxfam staff were not left untouched by the disaster. Before we join the chorus of criticism about Oxfam, let’s remember what really matters. The government has reaffirmed a commitment to introduce a Universal Service Obligation for broadband, rejecting an offer by BT Openreach that fell short of that objective. On the Today programme today, the minister responsible for digital policy, Matt Hancock, seemed to me to be saying that the way to achieve universal coverage was to encourage competition and more diverse providers. Competition, in its nature, can’t and won’t do that. Competition depends on firms finding an advantage, and choosing what to do and what not to do. The basic comparison to make is with the postal service; universal services mean that everyone should get mail delivered, regardless of location, at a specified price. Earlier this year, Ofcom looked at the technical issues involved in extending broadband services. Among other things, they noted that none of the main providers would be interested in competitive tendering to administer a UniversalService Obligation. BT Openreach had proposed a rollout where a small proportion of households – 0.8% – would be diverted towards satellite links or asked to meet the costs of connection. That’s a bit like saying that postal services to remote areas will be suspended unless people pay a premium (they already do for parcel deliveries.) Commercially and economically, it always makes sense to unload costs on to the consumer; after all, people in the Western Isles could pick up their post in Inverness. That misses the point of having universal services. The costs of serving remote communities can’t be met without pooling of resources between those communities and others.